Chop up the beef and toss it into the marinade while you make the chimichurri. For the chimichurri, put all the ingredients into the food processor and pulse until a paste is formed. The chimichurri has the tendency to get brown, so cover it while you are waiting for the food to cook. Skewer up the shrimp and beef. Grill on high heat to brown and cook to desired doneness. Meanwhile, make the rice according to the package instructions. When it is done cooking, mix in 2 tablespoons of the chimichurri. 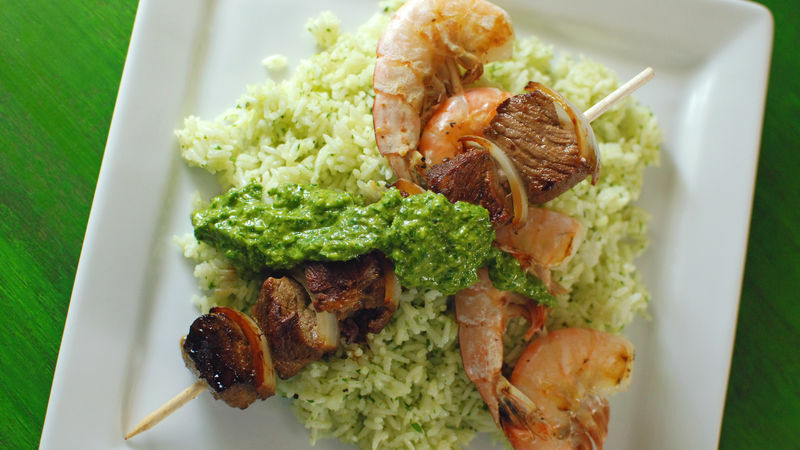 Serve the kabobs over the rice with extra chimichurri on the side. This time of the year, there’s nothing better than grilling with a beer in your hand! The best recipes are the easiest ones, so they don’t distract from playing lawn games, enjoying company, and of course, sipping that beer. That’s what makes chimichurri such an awesome sauce. You can whip it up in a food processor in no time flat, and I usually have enough herbs lying around to make it without going to the store. This sauce tastes great on anything, from empanadas to pizza, but the best use for it – and its original use by the cowboys down in Argentina – is for slathering on grilled meat. These Surf and Turf Kabobs with Chimichurri might just be my summertime staple this year. Seriously, pop everything in the food processor and call it a day. Don’t feel tied to these herbs either, whatever you have is fine, as long as there are at least 3 different herbs in the mix and there is more parsley than anything else. A quick teriyaki marinade on these guys is all you need. Meanwhile, cook some rice, and lay some of that chimichurri right in there. Here’s the meat getting nicely caramelized. I had some really nice shrimp, so I just cooked them with the shell still on. The perfect meal for this time of the year! Dan Whalen doesn't like when recipes get in the way of beer drinking. He has been blogging for over 4 years at The Food in My Beard; check Dan's Tablespoon profile often to try his recipes with creative international spins!